Back in September I stared exercise classes. I am still going to classes and I am still wearing my old ribbed tank tops and not the "appropriate" work out wear, but that is ok. I haven't run into anyone during zumba or cleared the room in a long time. 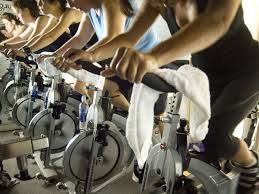 Last Friday for the first time I gathered up all my courage and tried a spin class. I'm not going to lie. I was scared to death! I have never really ridden on a bike for an extended amount of time. I prefer to get off of it to push it up a hill if needed while riding with the kids. How in the world was I going to handle riding for 45 minutes! Plus it sounded super boring! Sit on a bike for that long without going anywhere! Why in the world are these classes always close to full!? I got a few pep talks from friends who are instructors and avid spinners. Most of those talks only made me more scared as they stared throwing out vocabulary I had never associated with a stationary bike before. In the end, I arrived a little early and introduced myself to the instructor and asked for pointers. He got me set up on a bike (in the very front) which I didn't realize was so complicated! Adjust the seat, the handlebars, the gears. My head was spinning! (LOL! I kind of think I'm funny this morning) The ladies next to me assured me I would love it and gave me more pointers. I was a little more worried when I saw everyone had at least three towels draped on their handlebars. This was going to be rough! In the end, I didn't fall off my bike like I thought may happen in the middle of class. I wouldn't have been able to talk to you in the middle of class, however, as I was concentrating on remembering to breathe so I wouldn't pass out and I was tempted to coast down the hills instead of put it in a lower gear and pedal! I also found out I can sweat from my elbows and spinning was a very very intense workout!